Support Home Paya Virtual Terminal How do I manage users in the Virtual Terminal? The Virtual Terminal (VT) can have multiple users with different levels of access. Users can be signed in simultaneously. Manual Transaction: allow/deny the ability to process individual credit card sales. Use the box on the right to set a maximum transaction amount, or leave it at $0.00 for unlimited. Manual Credits: allow/deny the ability to process credits (refunds). Again, use the box on the right to set a maximum amount, or leave it at $0.00 for unlimited. Recurring Transactions: allow/deny the ability to create recurring customers that run automatically on a regular schedule. Batch Operations: allow/deny the ability to settle batches, etc. Press Add User to create the subuser. 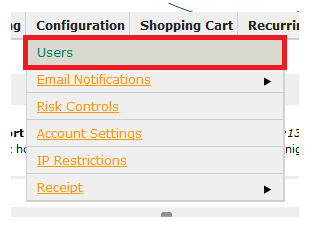 You can change or remove your users at any time by returning to the User Management page and selecting Edit or Delete.